What is beIN SPORTS CONNECT? beIN SPORTS CONNECT is a multi-device sports player that you can watch where you have Internet access on your laptop, desktop computer, or mobile device. Does beIN SPORTS CONNECT have a catch-up / Video on Demand service? Yes, beIN SPORTS CONNECT provides a catch-up service for all subscribers. What is beIN XTRA LIVE? beIN XTRA LIVE is a service we offer so you can watch games exclusively via beIN SPORTS CONNECT that we were not able to show on our regular broadcast channels due to scheduling clashes. Can I watch every Premier League game LIVE? All subscribers to beIN SPORTS CONNECT will be able to watch every Premier League game LIVE, either via beIN SPORTS 1 or via beIN XTRA LIVE. I’m a beIN SPORTS via SKY customer, am I entitled to access beIN SPORTS CONNECT at no additional cost? SKY subscribers are eligible to access beIN SPORTS CONNECT at no extra cost using their SKY login details. To login simply visit the login page on the beIN SPORTS CONNECT website or app, click the SKY icon and enter your SKY account details. What subscription options are there? There are two recurring subscription plans available for beIN SPORTS CONNECT; monthly (NZ$19.78 per month), and yearly (NZ$197.80 per year). Sounds great! How do I subscribe? Visit our 'Subscribe' page to select a suitable plan then create an account. I was a subscriber, but I let it lapse so how do I re-subscribe? Your username and password will remain active, even if your subscription has expired. 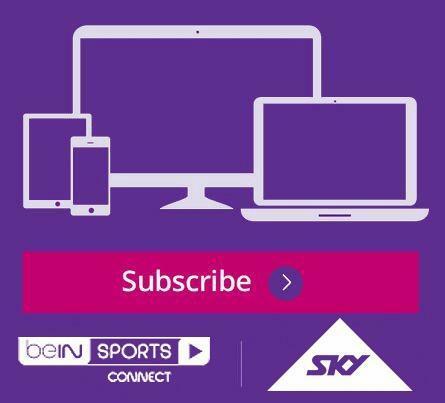 So you can just log in to beIN SPORTS CONNECT and re-subscribe to the service via the 'Subscription' page. I am trying to subscribe but am told my region is different? If you are outside of New Zealand you won't be able to subscribe or view content on beIN SPORTS CONNECT. If you are located within New Zealand and are receiving the message then it will be a result of your IP address being incorrectly registered by your ISP. Does beIN SPORTS CONNECT offer a pay-per-view subscription option? No. beIN SPORTS CONNECT offers both monthly and annual subscriptions allowing full access to the service. By subscribing to beIN SPORTS CONNECT do I have full access to all available content? Yes, both monthly and annual subscriptions provide full access to the service. How can I contact beIN SPORTS for further information? Please visit the 'Contact Us' page. How will beIN SPORTS CONNECT affect my download limit with my Internet service provider? Watching beIN SPORTS CONNECT is like watching any other streaming service. If you already watch other Internet streaming services such as Netflix or YouTube then you shouldn't notice much difference in your bandwidth usage. If, however, you are new to streaming content, we recommend you monitor your usage and consider increasing your download limit with your ISP. The video is skipping or choppy, what can I do? If you’re running other bandwidth intensive programs, such as Outlook, Spotify, BitTorrent, Vuze, Internet phone service (Skype, Vonage, etc. ), downloads, etc. try pausing, or closing them. If your video stalls only in full-screen mode, try lowering your desktop resolution. Try turning off any CPU-intensive programs you're running, or rebooting your computer. Perform a traceroute. If you receive an output with 13 or more hops, the problem is most likely related to how your Internet Service Provider is routing your computer's requests to the website. Unfortunately, we are unable to fix this problem - you can try contacting your Internet Service Provider to request help. Does beIN SPORTS CONNECT have a Smart TV app? No, beIN SPORTS CONNECT does not currently have a Smart TV app. Does beIN SPORTS CONNECT have an XBOX app? No, beIN SPORTS CONNECT does not currently have an XBOX app. Does beIN SPORTS CONNECT have a PlayStation app? No, beIN SPORTS CONNECT does not currently have a PlayStation app. Does beIN SPORTS CONNECT support Chromecast? Yes, beIN SPORTS CONNECT supports Chromecast on all Android devices, as well as from Google Chrome web browser. Does beIN SPORTS CONNECT support AirPlay? Yes, beIN SPORTS CONNECT supports AirPlay on all iOS devices, as well as from the Safari web browser. How will beIN SPORTS CONNECT affect my data allowance with my mobile service? Watching beIN SPORTS CONNECT is like watching any other streaming service. If you already watch other internet streaming services such as Netflix or YouTube then you shouldn't notice much difference in your data usage. If, however, you are new to streaming content, we recommend you monitor your usage and consider upgrading your data plan with your mobile provider. Alternatively, you can watch beIN SPORTS CONNECT while connected to WiFi. What speed setting should I use for live content? The beIN SPORTS CONNECT player incorporates adaptive streaming when available, so will always provide you with the best quality video available on your internet connection. This is also aimed to ensure that content doesn't buffer when your internet connection drops in speed (it is not a constant value at all times). In addition, the live player on beIN SPORTS CONNECT also allows you to manually select your speed. Sometimes this allows you to achieve a slightly better quality but may result in some buffering. Can I stream on more than one device? No, you can only stream from one device at a time. How many devices can I use to watch beIN SPORTS CONNECT? You can watch beIN SPORTS CONNECT from any number of devices. What devices does the service support? PC/laptop and mobile applications including Android and iOS applications on smartphones and tablet. Do I need to disable antivirus software or firewalls to use beIN SPORTS CONNECT? You don’t need to disable your antivirus software to use beIN SPORTS CONNECT. For firewalls at home: Please accept the request from your firewall asking if it's OK to access beIN SPORTS CONNECT. To make beIN SPORTS CONNECT an exception to your computer's firewall, go to your Internet Provider's Help section and follow the instructions. For firewalls at work, please contact your company's Information Technology department. Do I need to be connected to the Internet to stream games on beIN SPORTS CONNECT? Yes, beIN SPORTS CONNECT streams live and won’t be cached. You’ll need to be connected to the internet to stream content. Streaming allows you to play a program straight from beIN SPORTS CONNECT via the Internet, without you having to download the program to your hard drive or mobile device. If you are outside of New Zealand you will not be able to subscribe or view content on beIN SPORTS CONNECT. If you are located within New Zealand and are receiving the message then it will be a result of your IP address being incorrectly registered by your ISP, so please contact them.